1. Click on the INLOOX PM or INLOOX NOW tab. Click on the Arrow below Help. 2. 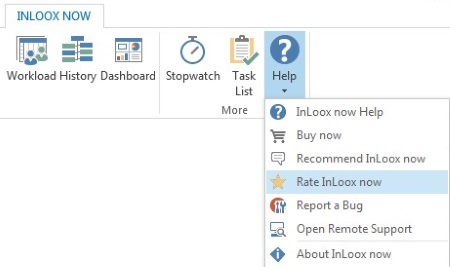 Select Rate InLoox PM or Rate InLoox now from the drop-down menu. 3. A dialog box will open. Assess InLoox by selecting the number of stars - the more stars you select the higher you rate the InLoox software quality. 4. If you want to share additional information, you can leave a comment in the Comment box. 5. Click on OK to submit your feedback to the InLoox PM development team. Rate InLoox 9 for Outlook • Copyright 1999-2019 © InLoox, Inc. All rights reserved.